Blurb: The ‘Pirate of the World’ is locked up in a high-security jail in Malaysia. He is desperate to reunite with Dao-Ming, his girlfriend. Andy Karan, an undercover spy from India’s top-secret organization, ‘The List’, is on a mission to find his colleague’s murderer in Goa. He has a plan for the pirate. A plan that will kill two birds with one stone. Their playground is the high seas off the Indian coast. With the all-too-common rave parties in Goa, a new drug called ‘magic’ is altering the inter-gang dynamics. But can Andy trust the pirate? Or his own instincts in an unfamiliar terrain? Kulpreet Yadav is a bestselling author, motivational speaker, startup mentor, and Founder-Editor of Open Road Review, the leading ‘Literature and Culture’ online magazine of South Asia. 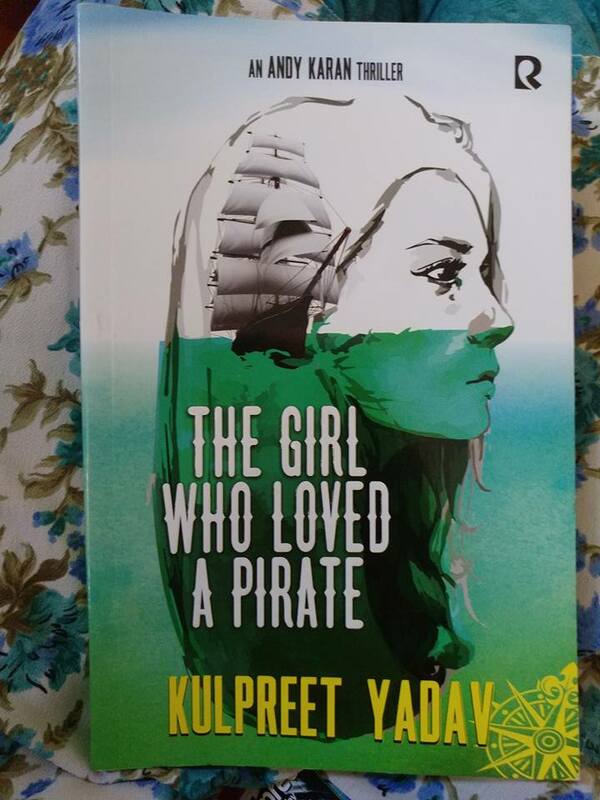 Kulpreet’s latest novel, The Girl Who Loved a Pirate, is India’s first thriller based on marine piracy & hijacking. 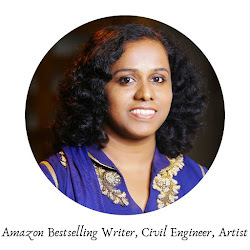 Passionate about Creative Writing, Kulpreet also mentors aspiring writers at schools and colleges and has spoken at many literary festivals in India & abroad. An ex-armed forces officer, he lives in New Delhi. Andy Karan, an investigative journalist and an undercover agent belonging to India’s secret agency called ‘The List’, takes you with him through this book on an unforgettable adventure that plays out in Goa, Malacca, to the crime filled interiors of the drug mafia and the intriguing world of the Pirate of the world, Ba-Qat. The author has weaved a memorable love story too into this action thriller between the beautiful Dao-Ming and iron-willed pirate Ba-Qat. The prologue and the Epilogue gives a different touch to the writing style and throws light upon the character of Andy Karan and the backstory of Ba-Qat respectively. 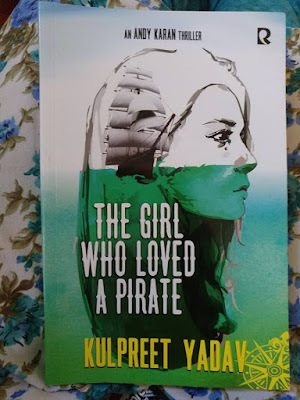 ‘The Girl who loved the Pirate’ is filled with action sequences. The part I liked most was where Ba-Qat captures the North Korean ship. The details the author has included makes sure you will have bitten off half your nails by the time you reach the end of the sequence. The language is simple and hence the book is an easy read. The depth in the details is proof of the research that must have gone into the writing of this book. 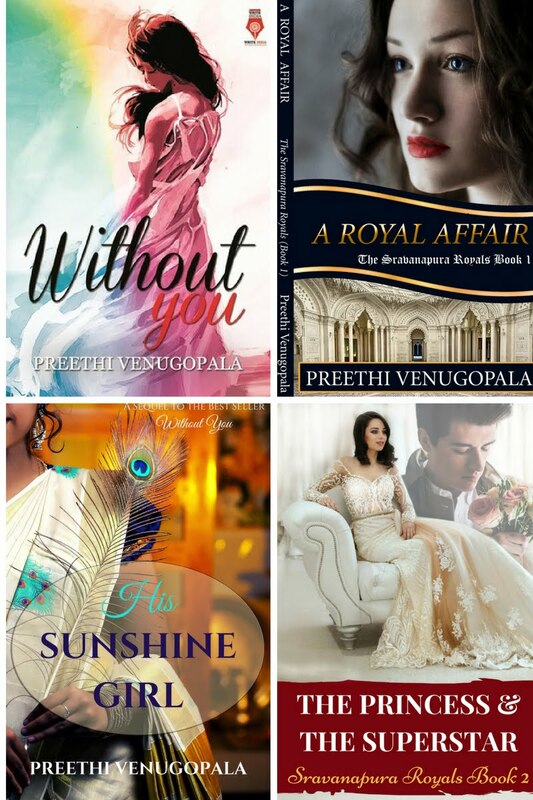 The book takes a bit of time to capture your attention initially, but once it does, it races to the finish line without a hiccup and you turn the last page with the satisfaction of having spent time reading something wonderful. Recommended to all thriller lovers. On 24th of May 2017, Penguin Random house India will bring you an intriguing story of forbidden love written by the beautiful and talented Faiqa Mansab. Faiqa feels Shams Tabrez wrote this verse for this very story she had to write hundreds of years later. She confesses she is a little mad about words and the connections they can make over time and space. 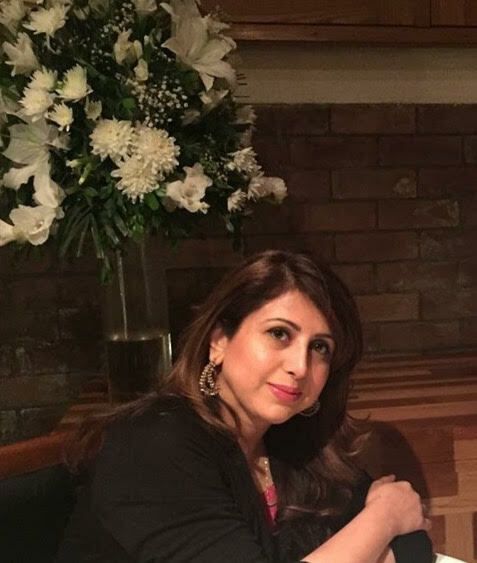 Faiqa Mansab has a Masters and an MPhil in English literature. She did an MFA in creative writing from Kingston university London in 2014 with a distinction. Her award-winning thesis culminated into This House of Clay and Water. She lives in Lahore with her family. She also teaches creative writing as visiting faculty and conducts creative writing workshops for writers. 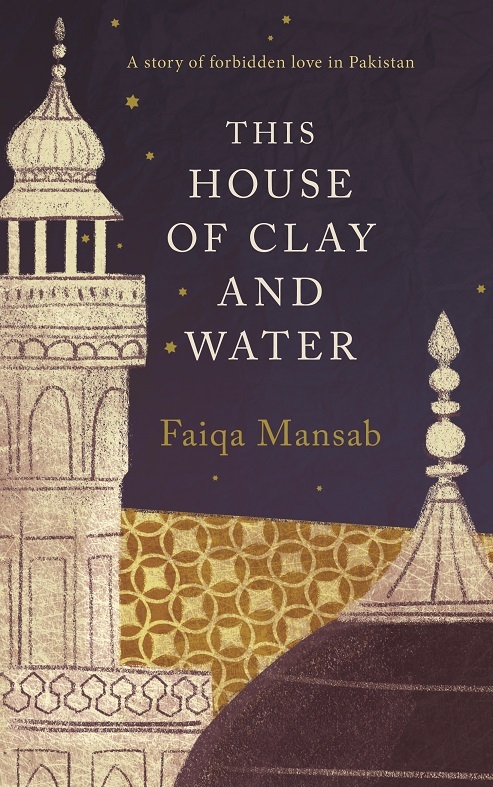 Set in Lahore, This House of Clay and Water explores the lives of two women. Nida, intelligent and lonely, has married into an affluent political family and is desperately searching for some meaning in her existence; and impulsive, lovely Sasha, from the ordinary middle-class, whose longing for designer labels and upmarket places is so frantic that she willingly consorts with rich men who can provide them. Nida and Sasha meet at the famous Daata Sahib dargah and connect—their need to understand why their worlds feel so alien and empty, bringing them together. On her frequent visits to the dargah, Nida meets the gentle, flute-playing hijra Bhanggi, who sits under a bargadh tree and yearns for acceptance and affection, but is invariably shunned. A friendship—fragile, tentative and tender—develops between the two, both exiles within their own lives; but it flies in the face of all convention and cannot be allowed. Faiqa Mansab’s accomplished and dazzling debut novel explores the themes of love, betrayal, and loss in the complex, changing world of today’s Pakistan. You will have to wait till the 24th of May 2017 to read it. But, you can preorder it from the below link. “A good journal entry- like a good song, or sketch, or photograph- ought to break up the habitual and lift away the film that forms over the eye, the finger, the tongue, the heart. I love journaling. Be it the morning pages, creative journals, dream journals, bullet journals, or reading journals; my journals are close to my heart. 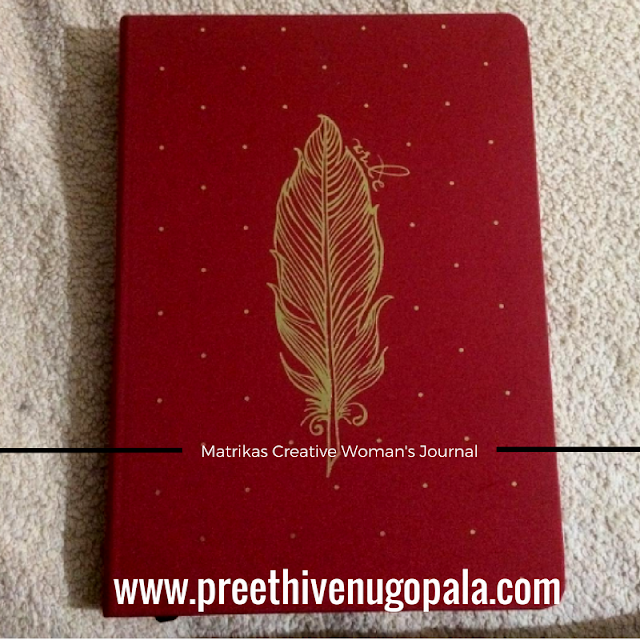 Hence, when I received the Creative Woman's Journal from Matrikas for review as part of the 'scribble your heart away' campaign, I was excited beyond words. Reason? It is the prettiest journal I have ever owned. Take a look at it yourself. Isn't it gorgeous? The cover has a beautiful golden feather (or quill) with the word 'write' printed to the right side of the feather. Golden dots decorate the entire cover. I was impressed. A Golden quill that urges to write! This beautiful journal has eight adult coloring pages that feature art inspired by nature. Butterflies, flowers, dragonflies and fruits are printed in these pages waiting for you to color them. In order to indulge your creativity further, there are blank pages where you are invited to doodle or draw or paint. This is where you can record your personal details and brand the journal as your own. A page has been allocated to create a list of places you wish to visit. This page is dedicated to recording details about your important friends along with their address. 6) A paper pouch for keeping important papers with an elastic band for safe locking. 8) Books to be read page. 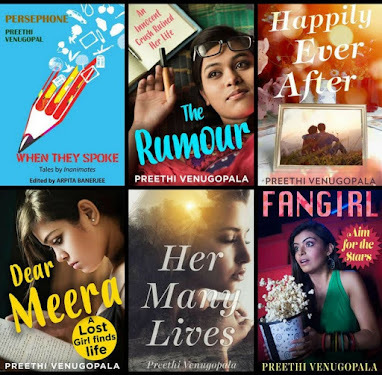 Note down the list of books that you wish to read in this list. Scribble away your thoughts in the ruled pages that make it easy to write neatly. 10) An elastic band which acts as a pen holder. 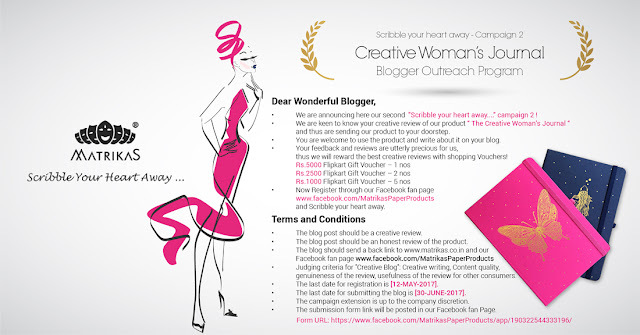 Take a look at this video which takes you into the inside pages of the Creative Woman's Journal. Do you wish to own this journal? Go to the Matrikas Website and order one for yourself.Trust me, it will be worth every penny. Or if you are a blogger, hop onto their Facebook Fan page for participating in the 'Scribble your Heart Away' campaign-2 and get a chance to review the journal. There are prizes to be won too. Take a look! Hurry, the last date to register is May 12th. Disclaimer: I received the product for free from Matrikas. The review is unbiased and is my own opinion about the product.